Pack your skis in a cardboard box or ski bag – please no skis longer than 210 cm. Attach an order with the desired kinds of grinding (see stone grindings) and mark the skis (which grinding on which ski). Attention! The skis have to be cleaned and free from kick and sliding wax. 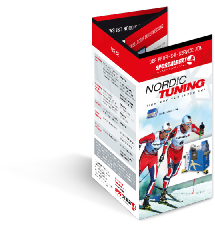 Subscribe to pick-up service on info@nordic-tuning.de or by fax 037465-2573. Please specify your full address. The DPD then picks up the package from your premises within 2 days. After servicing, we send the skis back to you.